In the wake of the release of Infinity, Marvel's huge summer crossover of 2013, which sold out of it's first run of printed books, I've decided to go back and take a look of some of Marvel's other crossover events with an eye on those that might influence the Marvel Cinematic Universe down the road. 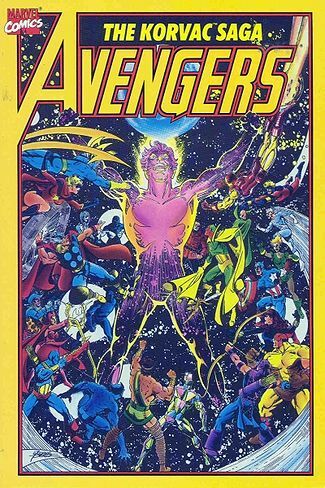 The 1991 crossover written by the overlord of Cosmic Marvel and Thanos creator, Jim Starlin, is a must read given the fact that we know Thanos will continue to play a role in the events of the MCU. Infinity Gauntlet see Thanos, who has recently collected all 6 Infinity Gems, place them together into a gauntlet and become an omnipotent god with control over all of spacetime. In an effort to please Death, Thanos uses the collected power of the gems to exterminate half the life in the universe, including most of Earth's heroes. In the wake of the destruction the remaining heroes, led by Adam Warlock, battle Thanos for what's left of the universe. 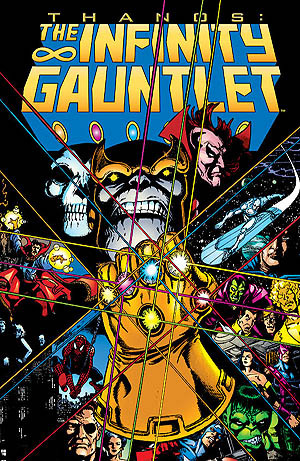 A mix of Cosmic and Earth bound superstars, Infinity Gauntlet is sure to be the inspiration for a major MCU crossover down the road. This 1977 classic is a huge crossover full of time travel and involves a mix of 691 and 616 heroes and villains. The Korvac Saga includes a huge appearance by galactic nutter, The Collector, who will be added to the MCU possibly as early as this November in Thor: The Dark World and definitely in next summer's Guardians of the Galaxy. Traveling through spacetime, Korvac arrives in the 616 universe pursued by the original team of Guardians of the Galaxy, led by Starhawk. All-powerful and invincible, Korvac is a threat too great for even Earth's Mighties Heroes and is intent on remaking Earth to suit his vision. This is a great story of redemption and makes you wonder, after all is said and done, just what separates good from evil. This nearly year long follow up that finished up in early summer of 2008 is notable because through it two major Cosmic franchises were reborn: Guardians of the Galaxy and Nova. 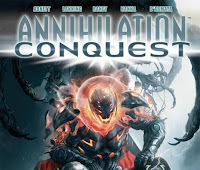 Picking up after the events of 2006's Annihilation, Conquest sees the Phalanx, a creepy techno-organic species, isolate and attempt to conquer the Kree empire. Peter Quill reclaims the mantle of Star-Lord and forms a team of misfits for a suicide run against the Phalanx and Richard Rider finds himself, the last remaining member of the Nova Corps, right in the thick of things. 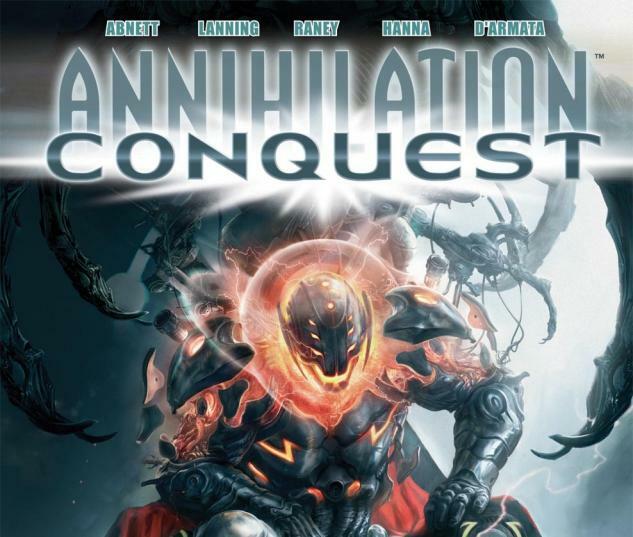 Marvel film rights aren't exactly black and white and I'm not sure that Marvel Studios own the rights to Annihilus, the villain of the 2006 arc, Annihilation but this story, which includes a disembodied Ultron finding a new host, would play wonderfully on the big screen. I'm actually finishing this up now and have loved reading through it. In a lot of ways, I've preferred it to Annihilation. These 3 crossovers seem most likely to be able to fuel, in some way, some future MCU films. We know that Marvel Studios will take some liberties and can only play with the toys they have in their own sandbox, but it think it's a fair bet that some of this sees the cinema before long. Thanks for reading. 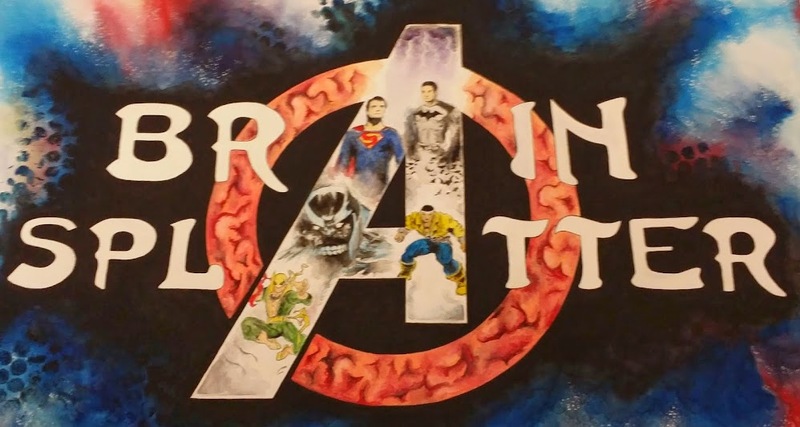 Don't forget, if you like the content you're getting here, sign up for the mailing list and get updates daily on Comic Book Brain Splatter!